Located in Waltham, Massachusetts, Brandeis University is ranked in the top tier of universities in the country. Founded in 1948, and named for the late Justice Louis Dembitz Brandeis, the first Jewish Justice of the U.S. Supreme Court, Brandeis is the only nonsectarian, Jewish-founded university in the country. The University is known for its academic excellence and ideals of social justice in honor of its namesake. At the same time as Brandeis’ founding, eight women from Boston, all leaders in the community, were asked to help in supporting this new university. They were given the task of building on the collection of 2,000 books in the Library, which was housed in a converted horse stable. The dedication and perseverance of these women, who called themselves the Brandeis University National Women’s Committee continues today, sixty-one years later, as the Brandeis National Committee (BNC). 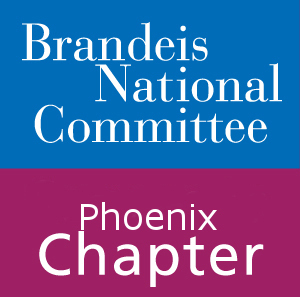 With over 70 chapters nationwide and over 39,000 members, BNC is the largest “friends of a library” organizations in the world. Over the years, we have placed over one million books in the Brandeis libraries, and raised over $100 million for Brandeis University and its libraries, scholarship and research. Brandeis University has become one of the youngest private research universities, with ground-breaking exploration in neurodegenerative and age-related diseases. Our Phoenix Chapter founded in 1950 by volunteers, is proud to be a part of this wonderful endeavor. The funds we raise from our events and study groups help to support the development and expansion of Brandeis’s libraries, scholarships, scientific research. The school is able to purchase books and research journals, restore and preserve books and film, develop information technology, provide deserving students financial assistance, and continue funding ground breaking research. While most of us did not attend Brandeis University nor have visited, we are dedicated supporters to a university that prides itself on bringing together many people of different ethnic, religious and cultural backgrounds.